Have you ever lived in Ottumwa, been to Ottumwa, know someone who lives in Ottumwa, been through Ottumwa or heard of Ottumwa? That’s a long, drawn-out question, right? What I really want to know is, do you have pictures of the people, places and events of the Ottumwa community? They don’t have to be current - they could be from last week, last year or a few decades ago. You do? Awesome! You can help the Greater Ottumwa Convention and Visitors Bureau put together an amazing digital photo album of what life is like in our community. The CVB will be sending Love Notes to Ottumwa during our 28 Reasons We Love Ottumwa Instagram Campaign. Using the hashtags in the picture above, we’ll post a picture featuring the businesses, special events and great people who live here, have lived here and have visited us. By the end of February, we’ll have an online collection of photographs that show Ottumwa from a variety of viewpoints and perspectives. Not only will it be fun for Ottumwans to have photos of their hometown, the CVB will be able to direct visitors and potential new residents and businesses to these hashtags and see what we’re really all about. I hope you’ll join us in this project. 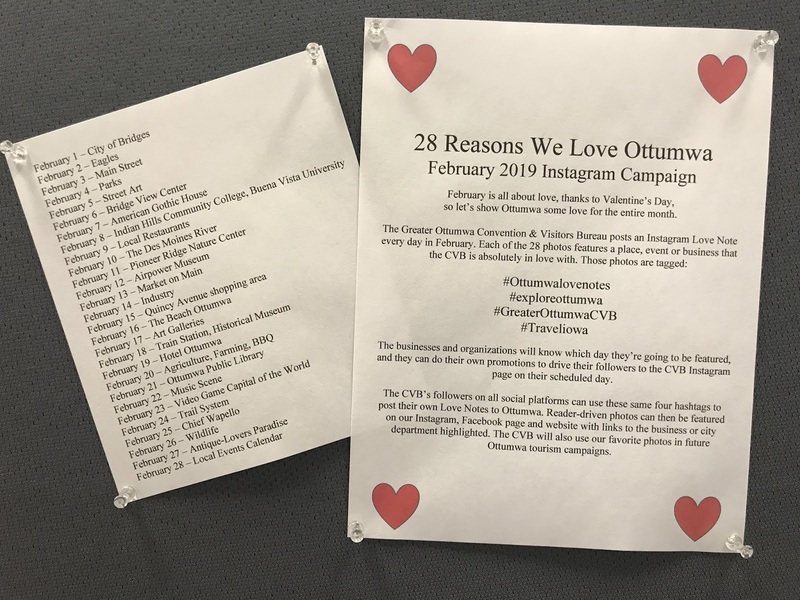 Head to the Greater Ottumwa Convention and Visitors Bureau Instagram page (greaterottumwacvb) every day in February to see the Love Note we’ve posted and post one of your own. You can also follow along on the calendar pictured here to look through your photo library in advance and be ready to share them with the Instagram community. If you could let everyone in your contact lists know too, that would be amazing. There are many former Ottumwans that have great photos and memories of their time here, and we’d love to hear from them. We start this Friday, and it would be great to see you all there! Thank you in advance for your contributions to our Instagram campaign.